What’s an inciting incident and what makes it so important? Why are writing teachers always talking about them? First of all, let’s get on the same page about what an inciting incident is. It is that moment at the beginning of the story when something changes and sets the plot in motion, or, as Mary Kole puts it in Writing Irresistible Kidlit , it is “the event that takes your character from his sense of normal (life and business as usual) and launches him into the main conflict of your story.” This usually takes place at or around the end of the first chapter, sometimes sooner. In Natalie Whipple’s Transparent (yes, the book I mentioned a couple weeks ago – it’s awesome! Check it out!) Fiona’s father is trying to force her hand to get her to murder someone, and she has to run away or become a killer. This catapults us into the story. Although invisible Fiona has done her dad’s bidding before, she’s never had to kill anyone, and this pushes her and her mother to take action and run away. It pulls Fiona and her mother out of their normal and into a world of conflicted plot awesomeness. In Jay Asher and Carolyn Mackler’s The Future of Us, Emma and Josh log on to the internet for the first time – and discover their Facebook pages, fifteen years in the future. Facebook hasn’t even been thought of yet, but their careers, spouses, kids, and status updates are all there. Every time they change something in their present, something in their futures changes, too. Aside from the fact that this is such a cool concept, it also causes Emma and Josh to act very differently in order to create the futures they want. They just don’t know what the unintended consequences will be. In Ender’s Game, Ender is accepted into Battle School, and his life completely changes. He is not allowed to see his family again for several years, and he’s going to be trained to be an isolated child warrior. This moment defines him. Why are these incidents so important? They tell us something about the main character – and if they don’t tell us something about the main character, they should. Most importantly, they kick off the plot of the story. What are your favorite inciting incidents? What else is important about this moment at the beginning of the story? P.S. One of my favorite inciting incidents is the Reaping in The Hunger Games (awesomely plotted, Suzanne Collins!). P.P.S. Check out my guest post over at The Art Abyss, How Perseverance Helps Creativity Blossom. Posted in Craft and tagged Carolyn Mackler, character motives, Ender's Game, inciting incidents, Jay Asher, Natalie Whipple, plot, Suzanne Collins, The Future of Us, The Hunger Games, Transparent, Writing Irresistible Kidlit. Bookmark the permalink. How Can I Help Debut Authors? And Why Would I Want To? Today is a very special day. 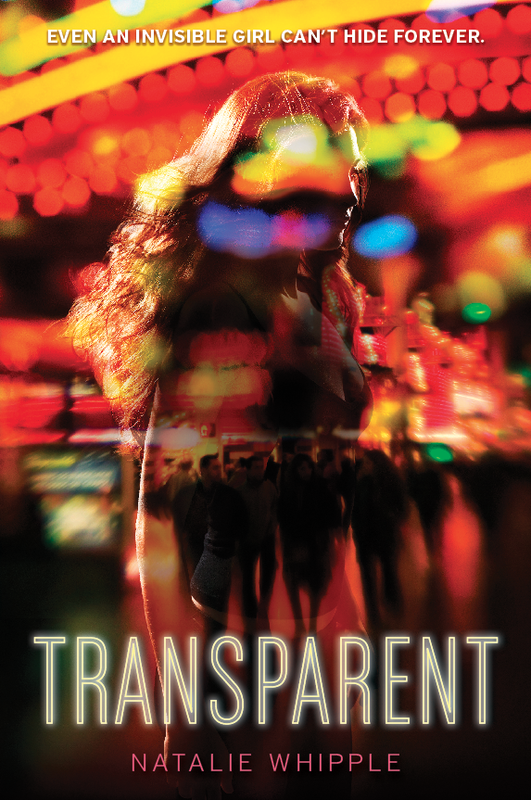 Today is the day that debut author Natalie Whipple’s book Transparent comes out. Transparent is about a girl with the power to become invisible whose mob boss daddy makes her do crazy stuff – and she wants to escape. What makes Natalie Whipple so special? Well, as of last summer, I hadn’t written much of anything that wasn’t work-related in about 7 years, since I graduated from college. At first, I wasn’t writing because I was teaching, and teaching in a bad area is an 80-hour-a-week job. Later, I wasn’t writing because I had gotten out of the habit. Last summer, I ran across Natalie Whipple’s blog, and I realized how much I really missed writing. She inspired me to write again (Side note: I’ve been following her blog since last summer, but I don’t comment on it frequently because of how often the Captcha ate my comments in the past. Boo Captcha). Although my current work in progress is far from finished, it is thousands of words more than it might have been if I hadn’t been re-energized by Natalie’s blog. How can we help debut authors like Natalie Whipple? And why do we want to? Spread the word. Tell your friends, ask for it at the library, post about it on Facebook/Twitter/Tumblr/etc., or even blog about it. Buy the book within the first 3 months it comes out. This seems obvious, but it’s worth repeating: if it’s an author you really want to support, actually buy the book. The first 3 months are when publishers are watching. Pre-order it or buy it in the store. And then write the review afterwards. Remember that buying it in a brick and mortar store does more for the author than buying it online. If you buy the book in a store, that store is more likely to stock an additional copy or two – and shelf space is at a premium. Shelf space is free advertising for books that they don’t get elsewhere. Why should we support these hard working authors? We should support them because good books need a leg up. There is only a certain amount of publicity budget available at publishing houses these days (and even less budget available for many self-published and indie authors), and mid-list authors with great books can benefit from a few extra recommendations ever so much. Getting the word out about authors and books we love is paying it forward. Every single mention counts. I’ve heard John Green got to where he is because his books spread virally before he made it big. What other advice would you add about supporting debut authors and their ever-so-fabulous debut novels? Where else have you seen debut author listings online? Posted in Culture, Journey and tagged blogging, books, debut authors, John Green, marketing, Natalie Whipple, publishing, Transparent, ya. Bookmark the permalink.